iQRAS is the latest addition to ITEM Software's suite of risk and reliability-software tools. The latest version of the software completes the transformation from the original software as developed by the University of Maryland and NASA. The new environment provides an extensive set of editing and reporting capabilities, in line with those found in ITEM ToolKit, our flagship suite of tools for reliability, availability, maintainability and safety analysis. 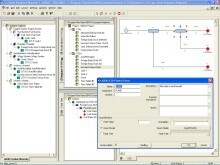 With iQRAS you can develop risk models in the form of event sequence diagrams and fault tree models. Event Sequence Diagrams (ESD) describe the possible risk scenarios following potential perturbations of normal system operations. Pivotal events in the risk scenarios are further detailed using fault tree models or other distributions. This defines the occurrence of those pivotal events as logical combinations of one or more basic events. Each scenario eventually leads to an end-state and consequence that designates the severity of the outcome of the particular scenario. The Event Sequence Diagrams are organized using a system hierarchy, consisting of structural or functional decomposition. A mission timeline allows the break down of the overall mission into multiple mission phases. This organizing capability makes for easy navigation between the potentially large numbers of event sequence diagram models, and tailors the risk scenarios to the particular conditions of a mission phase. A wide variety of quantification models are available to specify the likelihood of occurrence of basic events. 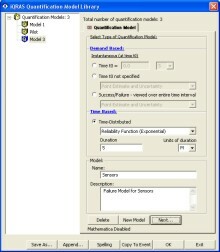 These include standard demand-based and time-based reliability models, as well as highly customizable models that take advantage of the optional link with Mathematica®. Additionally, iQRAS contains a centralized common cause failure-modeling feature. This enables common cause failure effects to be introduced across multiple fault trees. This feature significantly reduces the burden of introducing and maintaining common cause failure events in a model. Parameters in all models are specified by means of uncertainty distributions, which can be formed by common parametric models such as the lognormal, uniform, gamma, beta distributions, and probability histograms. For each distribution iQRAS contains flexible input modes that allow the parameters of the distribution to suit the needs of the analysis. Risk results can be obtained at the fault tree, risk scenario, or end state level. They can also be aggregated over multiple event sequence diagrams associated with a specific portion of the system hierarchy and/or a portion of the mission timeline. 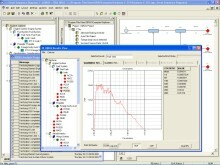 Analysis features include the estimation of total probability of reaching specific (undesirable) end states; the ranking of risk scenarios or risk scenario initiators by total risk contribution; cut-set analysis for the identification and ranking of critical combinations of events leading to a particular end state or consequence; and the computation of importance measures indicating the impact of individual basic events on the overall risk. iQRAS employs state-of-the-art Binary Decision Diagram-based analysis techniques, which are not subject to approximation errors found in traditional analysis techniques. Studies have shown these errors may span orders of magnitude. Monte Carlo (Latin Hypercube) Sampling including based uncertainty propagation techniques are used to determine the uncertainty surrounding numerical results. Separate importance measures are provided to identify the events contributing the most to overall uncertainty. To download a free demonstration of our Probabilistic Risk Assessment software iQRAS click here. The foundation for building a fault tree is the versatile user interface within iQRAS. It is capable of creating fault trees via a hierarchy mechanism, or a traditional fault tree diagram. 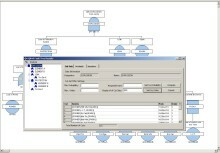 The fault tree diagramming mechanism is a feature rich, fully customizable diagramming tool.